For those of you not familiar with the city of Mississauga, it is what I consider the epitome of suburbia with tons of detached homes, semi-detached homes and townhomes; big box stores such as Costco, Wal-Mart and Rona (alright, you can find those stores just about in any city); huge roads often with three lanes on each side; and, a shitload of traffic on weekends (since everyone it seems works 9 to 5, Monday to Friday). If you’ve ever seen the intro music to the television show Weeds, that is the kind of the way I picture Mississauga. I should know because I lived in the city for a couple of years. Mississauga is also right next to Toronto on the west side so most of the concerts of the sleaze rock and hair metal category all seem to invariably find their way to Toronto rather than Mississauga. That being said, I was quite surprised to see a while back that Mississauga’s prestigious and grandiose Living Arts Centre was going to be the host to a number of Toronto area bands, which were headlined by perennial Sleaze Roxx favorites Diemonds. If you haven’t been to the Living Arts Centre, it is a classy venue that I think would be more akin to hosting an opera with older more conservative patrons than a rock n’ roll show with jeans and leather clad wearing younger rockers. 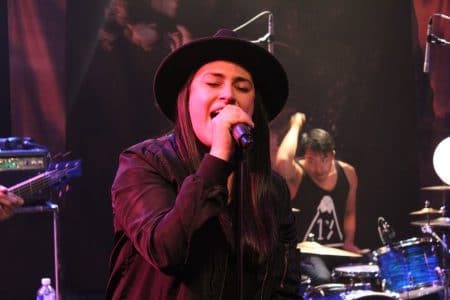 Nevertheless, on this night, the Living Arts Centre, in association with Mississauga Music, was promoting Women Who Rock and had assembled an impressive list of Toronto area female fronted bands. I had only really heard of two of the five bands on the bill. Diemonds of course have been one of my favorite bands ever since seeing them play for the first time when they opened for Slash at the Phoenix Concert Theatre in Toronto back in March 2012. At the time, I thought that they must have been some sleaze rockers from California given how great they sounded and how authentic they looked. I was flabbergasted to find out on that night that they hailed from Toronto and I have been a big fan ever since. It helps of course that the group has released two of the best records (The Bad Pack and Never Wanna Die) — in my humble opinion — of the last ten years. The other band that I was familiar with was the Odd Ones but mostly because three of the four band members were formerly part of the group J’Nai, which I had the pleasure of seeing play live three times in 2013. 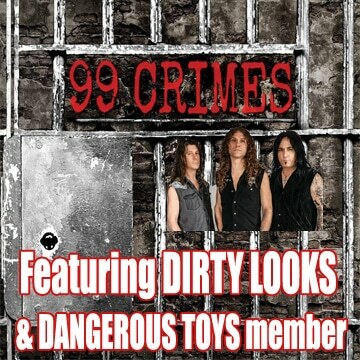 The rest of the bands on the bill were Polarity, Red Handed Denial and Darkstone Crows. I found a parking spot in time to make the 8:00 pm start time but Mississauga is a big place. Finding the huge Living Arts Centre turned out to be a bit of a challenge among the other large and quite spectacular looking buildings. By the time I got my press pass (thank you Living Arts Centre), Darkstone Crows were already playing. I was ushered into the RBC Theatre, which turned out to be a large room with high ceilings and balcony seating all the way around. The stage was just one stairwell step higher than the actual floor so getting to the front of the crowd was paramount to getting a good view of whomever was performing onstage. I ran into my friend The Meister (from the website Decibel Geek and the podcast CGCM). It had been a long time since I had seen him so it was nice catching up with him. The Meister advised me that the opening bands were only playing four songs each with Diemonds allotted a 40 minute set. Given that Darkstone Crows were already on their third song (a cover song if I recall correctly) and since I was busy chatting with The Meister, I really didn’t get a good feel for their music. However, Darkstone Crows‘ frontwoman Chanel Martins seemed to have a strong voice. Given that the night’s festivities were scheduled to end at 11:00 pm, there would have to be some very quick changeovers between one band to the next, and to my pleasant surprise, I barely had time to get a drink before the Odd Ones were onstage ready to rock. 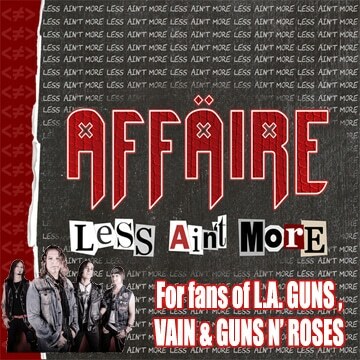 Now, I knew that the three former J’Nai members — female singer J’Nai, bassist Dave Alcordo and guitarist Richie Nguyen — had changed musical directions with the Odd Ones adopting a much stronger alternative rock direction than J’Nai who while covering a large gamut of sounds, was closer to what Sleaze Roxx might cover. I had heard a little bit of the Odd Ones‘ new material so knew that I would likely not like their music on this night but was still looking forward to seeing them play given that when performing as J’Nai, they put on a spirited and energetic set with a few choreographed moves to boast. It was also neat to see the youngsters four years later as they had all grown up a little bit looks wise. Odd Ones frontwoman Jeannette (who had dropped the J’Nai name) was her usual energetic self and Alcordo was still moving around quite a bit just like back in his J’Nai days. Nguyen was more stoic but also had a heavier load handling all the guitar playing (J’Nai had two guitarists). I can’t remember what songs they played but I know one track in particular reminded me a little bit of Rush with the more progressive rock music elements. Overall, it was nice to see the three former J’Nai members perform again although their music as the Odd Ones really didn’t resonate with me. I had never heard of Red Handed Denial but it became apparent early on that I would put them in the category of nu-metal, which Sleaze Roxx does not cover. 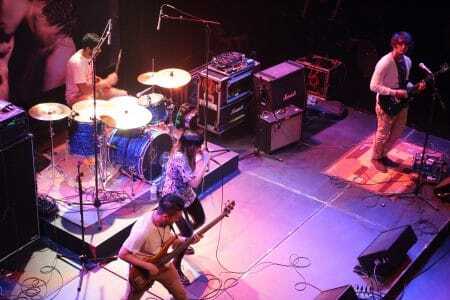 The group started its set by having four of its five band members (the exception being drummer Tyson Dang) with their back to the crowd near the drum kit. Before long, Red Handed Denial put on a spirited set. Unfortunately, the music played by the group is simply not what I am into so I can’t say that I was into their set by any means. 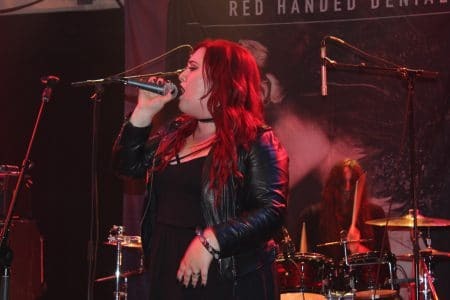 I am not sure if Red Handed Denial should really fall in the nu-metal category or not but the growly vocals exhibited by frontwoman Lauren Babic were definitely not for me. I much preferred when she was singing because she did have a nice clear voice. Interestingly, towards the end, one of the guitarists started off a song with a really good guitar riff so the potential for more melodic or straightforward metal was certainly there but that quickly dissipated into a wall of sound known to my ears as nu-metal. Although I didn’t like the songs played by Red Handed Denial, the group seemed to have a solid following in the crowd and many were singing along when prompted by Babic. At one point, Babic mentioned that while it was great to have this Women Who Rock concert, it would be even better if there were more females in the rock music industry and they didn’t have to put on these types of shows. It was an interesting perspective because when I saw the Women Who Rock ad, I just thought it was more of a celebration of “local” women who rocked rather than promoting a marginalized group. Polarity changed things up visually by putting up two big mostly white signs with their band name on either side of their drum kit. 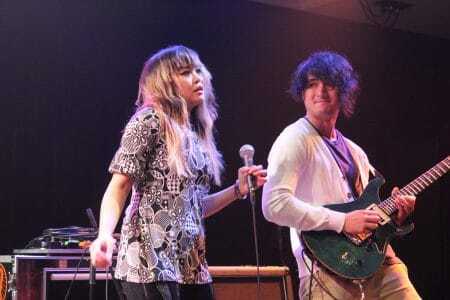 In addition, the group was fronted by the attractive and always moving frontwoman Jasmine who frequently went into the audience and expertly weaved her tiny frame between bodies. Jasmine‘s voice was fantastic and pierced through the wall of music blasted by her bandmates. Polarity definitely brought a new level of energy to the stage. Singer Jasmine and bassist Adrian DeSousa in particular seemed to really enjoy themselves while covering just about every inch of the stage. Just like the bands before them, Polarity‘s music is outside what I would usually listen to but it was definitely the best so far to my ears on this night (Diemonds were still to come). “What does this photo mean? It means mutual love and respect for other women in the music game. It means welcoming in the beauty and diversity of what each one of us has to offer while knowing with confidence there is a place and a space for each one of us to share our passions and ultimately it means supporting one another and choosing friendship over competition. We’re all in this game together and if women don’t have the love and support of other women, we’re missing out on a sisterhood that has the potential to change our world and the world of women around us for the better. Keep being bright lights on heavy stages ladies!!! Before long, it was time for the headliners — Diemonds — to take to the stage. As soon as the band launched into “Better Off Dead” from their latest album Never Wanna Die, I knew exactly why I had waited all night for them. It was almost like a huge wave of relief overcame me as I was finally hearing the music that I absolutely love from what I consider to be the best band to ever come out of Toronto. What can be said about Diemonds? They simply killed it on stage. Tons of energy, great songs and top notch musicianship make for a stellar performance and Diemonds simply had all of the components covered and more on this night. Frontwoman Priya Panda, who always seems to have some new ensemble, wore what appeared to be an intriguing black body suit of sorts. The ever friendly guitarist C.C. Diemond was all smiles in the hours leading to the group’s performance and you could tell he was really enjoying his time in the spotlight. In fact, all of the band members seemed to trade smiles and a general camaraderie that was really nice to see on stage. In particular, towards the end of the set, it seemed that C.C. 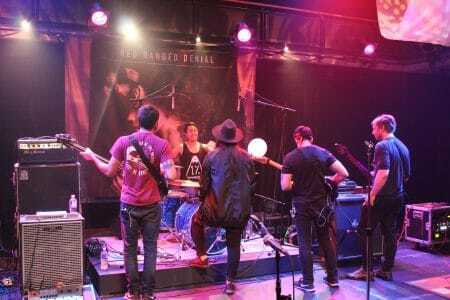 Diemond, guitarist Daniel Dekay and bassist Tyrone Buccione were having an informal competition among themselves on the best jumps or moves that they could do while playing their instruments. One thing that I really like about Diemonds — and that bands could certainly learn from — is that they are constantly changing up their setlist from one run of shows to the next. Even though I had seen Diemonds play back in June 2017, their setlist had changed somewhat and they also mixed up the order in which some of the songs were played to give a real fresh feel to their setlist. Even though The Bad Pack remains my favorite Diemonds album and was somewhat underrepresented on this night (only two songs were played from it at the end of the set), the group’s Never Wanna Die is a great album in itself so I was pleased to hear any tracks from that album and there were plenty with seven of the ten from that stellar album. Rounding off the set were two new Diemonds songs — “Our Song” and “Breathe” — which fit right in with the rest of the Diemonds catalogue. 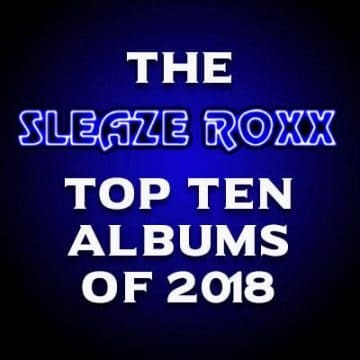 If all of Diemonds‘ new tracks for their upcoming next studio album are of the level of those two latter songs, the sleaze rockers are poised to deliver a third killer studio album in a row. My friend The Meister got a song dedicated to him by Panda — the aptly named “Wild At Heart” — as the frontwoman pointed out that the “person in the ball cap over there” had just recently followed the group through its (first ever) UK tour. Yes, The Meister is redefining what a “super fan” is all about and you can read all about his UK adventure following Diemonds at Decibel Geek. 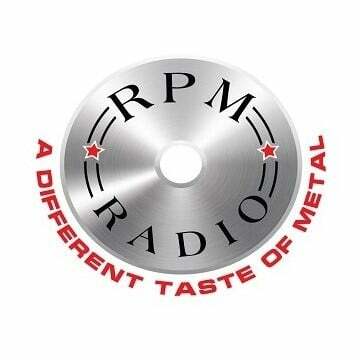 Given that The Meister is a “super” Diemonds fan, who better than to quiz about the group’s drummer situation? Surely, The Meister would know. 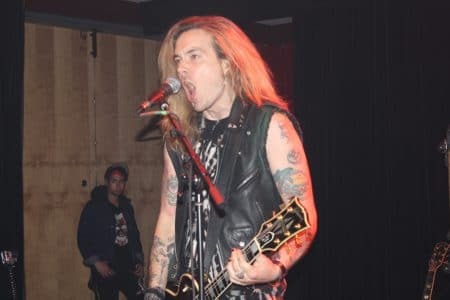 Although drummer Aiden Tranquada is still listed as the drummer on Diemonds‘ Facebook page and website, the man has been missing in action for quite some time. The Meister explained to me that Tranquada has been unfortunately suffering from a back injury that has kept him sidelined for some time. His replacement Kyle Lecourt did a solid job again on this night. 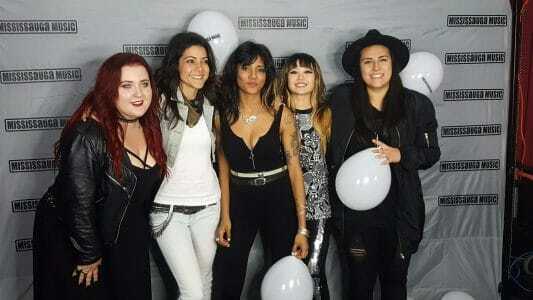 I am sure that this night was extra special for Diemonds‘ frontwoman Priya Panda who mentioned to the audience that she was born and raised in Mississauga not far away from the Living Arts Centre. 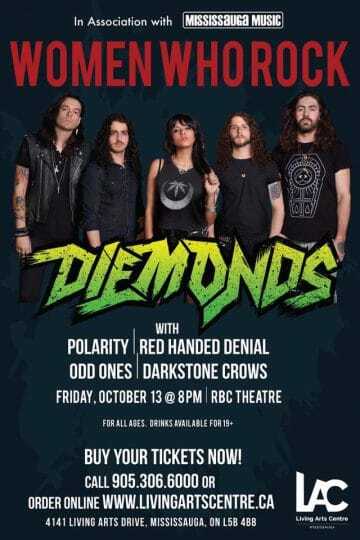 Funny enough, Panda advised that this was the first time that Diemonds were playing in the suburban city of Mississauga (in the band’s 10 or 11 year history) aside from a house party that the band had previously played for some of the audience members that were present on this night. This is even though the population for Mississauga topped over 700,000 people just last year according to a 2016 census. Hopefully, we’ll get to see Diemonds play again sooner rather than later at the Living Arts Centre because they simply put on a terrific performance. Diemonds (http://diemonds.net/) talking about the rockstar life ahead of their WOMEN WHO ROCK show @ Living Arts Centre (http://www.livingartscentre.ca/) on Friday the 13th!